Enjoy the Pinned Items feature in Pagico on your computer? Well, now you get to enjoy the same feature on the mobile side! The best part? Your pinned items are synced across your devices, so you can enjoy the speedy access to your favorite content wherever you go. The Pinned Items panel also features the much-loved instant task status charts, so you can stay informed on all your pinned items with a simple peek. Compatibility with the upcoming Workspace Sync Server in the E.U. 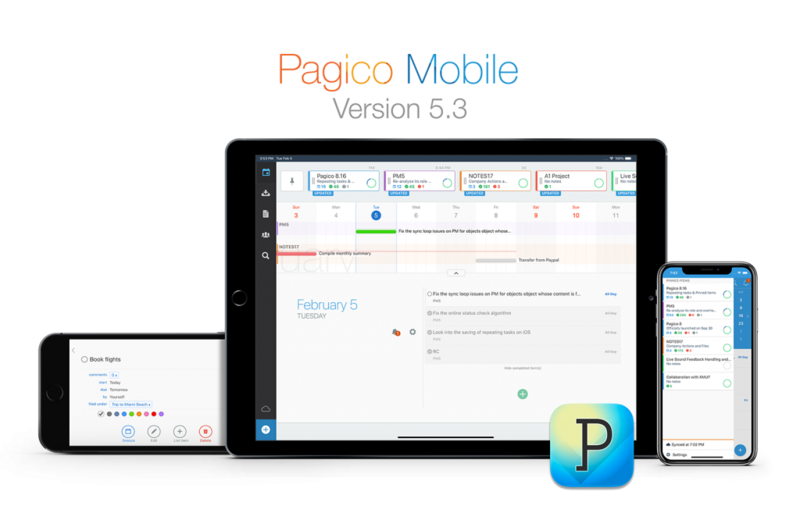 Pagico Mobile 5.3 is now available on the iOS AppStore, so go ahead and enjoy! We’d like to say THANK YOU to everyone participated in our beta program; we simply cannot be here without your contribution, and we appreciate your passion, time and willing to help very much! P.S. : Pagico Mobile 5.3 for Android is coming in a few days, too! Update: Pagico Mobile 5.3 for Android has been released on February 9.